DISCLAIMER: This is going to be my first review where I don’t really worry about keeping it spoiler-free… I’ve found that the people who are very spoiler-sensitive (like me) don’t read reviews anyway. That doesn’t mean I’ll start haphazardly throwing out key plot details and twists… but when I have something to say about one of those points, I’m just gonna say it. Beware. 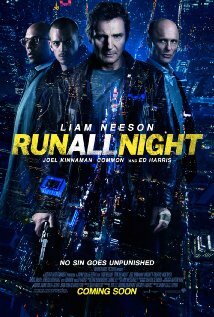 When I realized that Run All Night was the second* collaboration between Liam Neeson and Unknown director Jaume Collet-Serra, I was concerned. I had gone into Unknown hoping for something as straightforward and engaging as Taken, but I left severely disappointed and actually rather annoyed when some absurd storytelling liberties were taken (at least in my estimation). But Neeson’s earned more than enough good will for me to give the team another chance (Ed Harris’s involvement always helps). While Run All Night didn’t strike me as anything all that special, I came away entertained and essentially pleased. Jimmy Conlon (Liam Neeson) is an old, tired mobster. The numerous and unforgivable sins he’s committed in the line of duty have earned him special love and regard from lifelong friend and boss Shawn Maguire (Ed Harris) but have cost him every other meaningful relationship in his life, most notably with his son Mike (Joel Kinnaman). But when Mike witnesses Shawn’s son Danny (Boyd Holbrook) commit a murder, Jimmy steps forward to protect his son from Shawn’s wrath, exposing Mike to the life that Jimmy always tried to shield him from and testing the strength of their beyond-strained familial bonds. I wish I had more to say about the plot of the movie, but it seemed like pretty much what you’d expect from the chase/thriller action genre. Characters make questionable (i.e. stupid) decisions that put them into what should be impossible and inescapable situations but they manage to get out through sheer dumb luck or improbable resourcefulness. But, in the heat of the moment, it’s not hard to accept this unlikely string of events and, fortunately, the performances and character dynamics are interesting enough that you root for the good guys to survive and work out their differences. Even after seeing several of Neeson’s recent action roles, it’s strange remembering that this stone-cold killer was also Oskar Schindler once upon a time… not that that affects how effective and believable he is (the success of the Taken franchise is evidence of that [seriously though, it shouldn’t be a franchise]). Actually, Neeson’s presence and gravitas are part of why he was such a powerful figure in Schindler’s List and it seems that he’s simply translating that energy into this action hero armor. Predictably, he’s intimidating and exciting in all the right ways as Jimmy Conlon, but also exudes a vulnerability that, while not necessarily new, still feels fresh and compelling. Knowing Joel Kinnaman only as the new Robocop (which I haven’t seen), I didn’t know what to expect from him… but I actually really liked what I saw from him. He transitioned from loving father to concerned mentor to pissed-off son and everything in between with considerable ease. It was hard not to feel for the guy. As for Ed Harris, I’m not sure there’s an actor who plays a more empathetic and likable villain. His few scenes with Neeson are among the best in the movie. On that note, there was definitely something that I appreciated in the inevitability of the conflict between Jimmy Conlon and Shawn (shouldn’t it really be Sean?) Maguire. They can speak to each other on the phone after they’ve done (or will do) horrible things to each other and understand semi-rationally what needs to and will happen. While not revolutionary, the coldness and matter-of-factness of those exchanges were nevertheless fascinating and disheartening to witness. The bookending moments of warmth between the characters were especially touching and effective because of the harsh contrast of their understandable falling out. As for the ending, I’m glad they didn’t take the all-too common coward’s way out and have Neeson’s character miraculously survive multiple gunshot wounds to the gut. Of course, I don’t think there was any other appropriate outcome for his character in that it provided him the peace and closure he needed but I can’t tell you how many times I’ve walked out of a theater being furious that a character that really should have died at the end somehow managed to live. I’m glad I didn’t have to deal with that frustration and instead had a reasonably satisfactory conclusion to reflect on. Sometimes I’m too hard on movies for not providing much beyond simple entertainment. Other times, I can really appreciate a movie like Run All Night for its ability to keep me engaged and involved for its duration. I think a large part of that is because the movie embraces what it is and doesn’t try to do too much. It offers solid performances from interesting and reasonably complex characters with fun and exciting action (although there’s a bit too much of the shaky, handheld camera stuff [please, folks… leave that to Paul Greengrass]) and has some real heart. I think that’s an accomplishment worth acknowledging. *Correction: Run All Night is actually their third collaboration after 2014’s Non-Stop, which I actually found to be pretty entertaining.